Address module AM-01 detects proper operation of electronic ballast by means of a current threshold and reports proper ballast operation to HVCBS. Several current thresholds are available. The maximum ballast power is limited to 180W and inrush current to 80A. 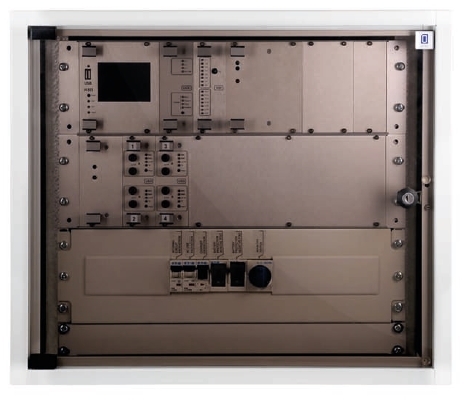 SOM-01 is a switch-over module. It allows to set luminaire operation between maintained and non-maintained operation as well as detect phase loss and control electronic ballast based on external switch signal. SOM-01 operates only on maintained HVCBS circuits from which the ballast is supplied. The maximum switching power is limited to 180W and inrush current to 80A. HYBRYDs HVCBS is a modular high voltage central battery system based on 19" rack standard. The system has been designed to comply with EN 50171, EN 50172, EN 50272 and EN 1838. It supplies emergency lighting luminaires with 230VAC or 216VDC nominal battery voltage on mains loss. HVCBS is intended to supply IT type electric luminaire networks during battery operation with a maximum power of up-to 27KW. The system consists of a main-station (cabinet) with several card types to which batteries are connected and optionally up to 32 substations. two types of tests are carried out – a short two minute luminaire and battery test and a nominal emergency operation time battery test. During the short test, batteries are also tested using a special algorithm. By design, tests are performed and read out by output circuit modules. This allows for a short test duration of tests and quick test data availability. All HYBRYD HVCBS modules that are intended to be used with luminaires are enclosed in HYBRYDs standard OM-167 enclosure. SOAM-01 is a switch-over address module. It allows to set luminaire operation between maintained and non-maintained operation as well as detect phase loss and control electronic ballast based on external switch signal. SOAM-01 operates only on maintained HVCBS circuits from which the ballast is supplied. Additionally SOAM-01 detects proper operation of electronic ballast by means of a current threshold and reports proper ballast operation to HVCBS. Several current thresholds are available. The maximum switching power is limited to 180W and inrush current to 80A. Switch-over module SOM-02 allows to control electronic ballast by means of an external phase from which the ballast is supplied directly. Voltage supplied from HVCBS has allways precedence. SOM-02 is designed to operate on non-maintained HVCBS circuits. The maximum switching power is limited to 180W and inrush current to 80A.